CHANGSHA, China, March 15, 2019 /PRNewswire/ -- Zoomlion Heavy Industry Science & Technology Co., Ltd. (Zoomlion), the leading Chinese machinery manufacturer, brought focus to female engineers and technicians as the company celebrated International Women's Day on March 8. Inspired to be a leader of the heavy machinery industry, one of Zoomlion's goals is to establish an equal working environment and promote women working in engineering, whose talent, strength and persistence have contributed to the company's ability to achieve great success. Fu Ling, 52-year-old, is a leading figure of construction machinery engineering in China and one of the many female engineers in Zoomlion who are thriving to make Chinese machinery shine on the international stage. She has earned numerous awards, including 32 national invention patents, one invention patent in Germany, as well as setting two industrial and national standards. 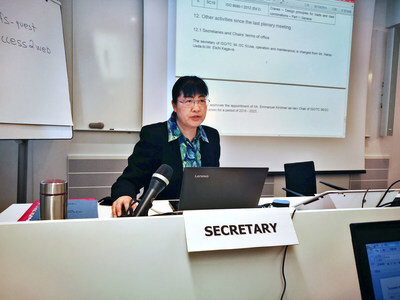 In 2018, Fu initiated a proposal for new international standards in the area of tower cranes at the 27th ISO/TC96 technical committee's annual conference, which was the first standard to be led by a Chinese expert. Zoomlion's breakthrough in international crane standardization has promoted the position of the Chinese construction machinery industry globally. She Lingjuan, a 32-year-old structure fatigue engineer in Zoomlion's Center Research Institute, has worked on the front lines of making Zoomlion's machinery safe and reliable. For seven years, she completed the seemingly impossible tasks of ensuring timely delivery of products, like preforming 85,000 fatigue durability tests within two days while facing the strict certification standards of the European Union and the client's tight deadline. "The foundation of my job as a fatigue engineer is thoroughly understanding the fatigue reliability theories and delivering prompt analysis and solutions to structural problems. There's great responsibility. I'm very proud to be part of the Zoomlion family and work with people who encourage and motivate me to improve continuously," said She. In addition to structure fatigue and reliability research, She also focuses on adopting smart technology to improve her work. As of 2019, Zoomlion has 298 female engineers. As 30.5 percent of all engineers, female engineers show great creative thinking, persistence and inspiring professionalism at work.